According to a 2014 paper a strategy that bought the S&P 500 in the even weeks after FOMC announcements and sold in the odd weeks, would have seen a 650% return since 1994, against a market return of 505% for the period. The opposite strategy (i.e. buying in odd weeks) would have had negative returns. 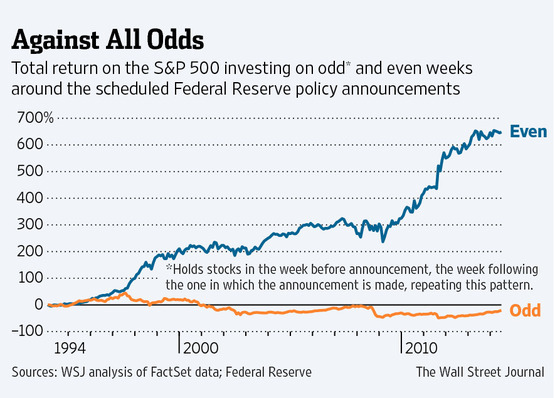 The following chart comes from the WSJ reporting on the findings in the paper. And this effect does not seem limited to the US market. 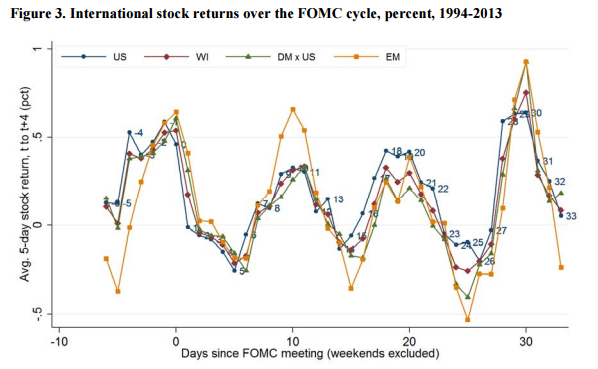 The following chart, taken from the original paper, shows the international returns over the FOMC cycle. Where, WI is the world index, DMxUS is the developed market index excluding US, EM is the emerging market index. All indices are in USD. This entry was posted in International, Week analysis and tagged FOMC, week by Almanacist. Bookmark the permalink.